Duchemin et Eggers, JCP 263, 37–52, 2014, section 6 propose to use their “Explicit-Implicit-Null” method to solve the Kuramoto–Sivashinsky equation ∂tu=−u∂xu−∂x2u−∂x4u while avoiding the stringent explicit timestep restriction due to the fourth derivative. 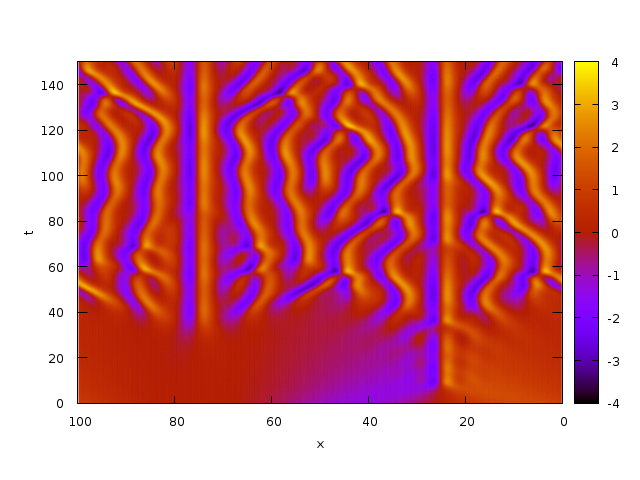 In this example we show that this can also be done using the implicit multigrid solver. This is the simple explicit discretisation (which is not used). We reproduce the same test case as in section 6.2 of Duchemin & Eggers. The timestep is set to 0.1, which is significantly larger than that in Duchemin & Eggers (0.014). The result can be compared to Figure 8 of Duchemin & Eggers.